Awards - Plum Award - (best new commercial) for “The Musseltones”, 1992. Hobbies - Djembe (African) drumming, guitar (long affair with songwriting, brief affair with own band), movies. This reality business, ie life, the universe et al. Specific expertise - My particular strength is the 3d character development pipeline, from design through modelling, texturing and rigging, to final animation, lighting and rendering. Professional projects - 2007 - Lead Artist Lloyds Bank "Keeping it Safe" training video. 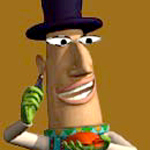 2007 - Character Artist Vernons.com Commercial. 2006 - Rigger, animator, CGI dogsbody Nationwide "Valuing Everyone".